I turned towards that scratched wooden fence, this time it didn't look frail & dusky. 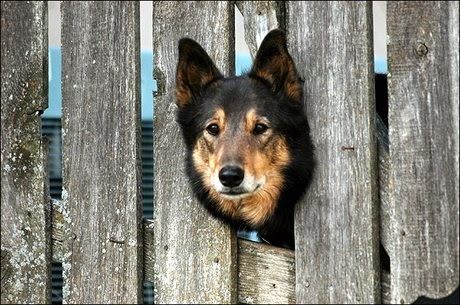 As those pair of eyes followed me till the end limits, I felt the strength of those fence. It is strong enough to obstruct the path of a curious explorer. Harsh enough to imprison an innocent heart's desire. Looking at it gave me a strange shiver, and I ran away fencing myself from reality. in five sentences you have told such a gritting and compelling story! p.s- the pic inspired me to write this 5 sentence fiction ! It's a wonderful way of using the prompt, The ending was marvelous. thanks a lot :D ! 2) the comma between "eyes" and "followed" is extraneous and interrupts the flow of the sentence. 3) "my own self" is awkward as it's decidedly less formal writing (as slang) than the rest of the piece. Next time, make sure you pay a closer attention to the grammar as you have a few issues here and there. hehehe! so your dog is a curious explorer too ;) !! Excellent, what else can I say! Nice story, very much a reality. Love the picture, added such a friendly nature to the poem. And the almost cautionary poetic feel is beautifully done. I loved that picture. And what can I say about your writing it's incredible.